LentillasSi.es is rated #1 in Customer Satisfaction by our users! Our customers scored LentillasSi.es 9.8 / 10 in customer satisfaction. 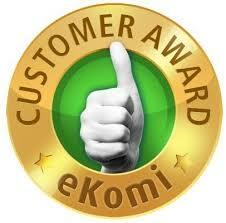 We already knew Susana was the best customer service rep on the planet, but now eKomi has certified the fact. I've checked the rankings of all the websites that sell contact lenses in Spain, and quite a few more that sell in other countries, and I didn't find anyone ranked higher than us. eKomi only awards gold for sites with ratings of 9.6 / 10 or higher, and I found NO ONE else that has a gold ranking. Besides Susana charming the customers, LentillasSi.es has a lot to offer: standard next business day tracked shipping, more than 2/3rds of ordered goods in stock (and that percentage is growing quickly), cheapest prices, lowest shipping costs (free in most cases), Confianza Online compliance, multi-layered web site security (including end to end encryption), and a fast, world class, "mobile first" website all contribute to the ranking. We have systems built to check every step of the user process. If we can't find the city associated with your postal code, we get informed. If a client has problems creating an account or adding a product to the basket, we get informed. We are constantly monitoring and improving every little detail of the customer experience. What we find encouraging is that there is still so much to do! Our sales are growing by leaps and bounds, but we are working hard every day to improve the experience. Improvements in payments, site speed, site usability, product selection and packaging are all in the works. We can't wait to find more ways to keep our customers happy!